Nothing can de-stress your body better than a massage. However, going out of your way just to schedule one can deter you from getting one. Therefore, if you regularly suffer from stress and would like to ease the tension it generates in your muscles, a Panasonic Massage Chair may be your best bet. If this entices you and makes you want to rush to your nearest electronics store, here’s a recommendation: consider buying a Panasonic massage chair. The electronics mogul has been designing massage chairs for thirty years and led the market for twenty. One of the reasons behind the company’s constant growth is the constant improvements it carries out to perfect the features and durability of each Panasonic massage chair. According to data from its factories, Panasonic’s chairs can easily continue operating to up to 7000 hours before you experience any problems. To further flaunt its confidence, Panasonic offers a five year warranty, which is much more than the conventional 2-3 years most chairs offer. Therefore, rest assured that you will enjoy massages for years to come and get the best value for every cent you pay. Moreover, a Panasonic massage chair is a worthy buy because its programming was created using input from human massage therapists. The chairs’ massage modes copy the hand and finger motions used in massage therapy, especially tapping, rolling, kneading and compression. So if you close your eyes and let your mind drift, your chair will easily become your own personal masseuse. If what you have read so far inspires you to get your very own Panasonic massage chair, here are three comprehensive reviews of the top three models around to save your time. The Panasonic EP-MA70KX Real Pro Ultra Full Body 3D Massage Chair with Heated Massage Rollers is a unique chair that offers 3D massages via its multi-directional rollers. Like its predecessors, it offers a very realistic massage experience. In fact, its double heated rollers simulate hot-stoned therapy, loosening tense, sore muscles, improving blood circulation, and reducing the tension in your limbs. This Panasonic massage chair also features six pre-set programs that target different parts of your body. For your hands and arms, the chair will kneed from above and below, taking your tension away. What further makes this chair a good buy is that the armrest automatically adjusts to your body to massage your arm and hand even if you are lying down, so your comfort is ensured throughout. As for your shoulders, airbags will knead your back, starting from your shoulders to your chest. Moving along, airbags near the waist and thigh will massage your torso and lower back whereas 3D air cushions will surround your feet, gently squeezing them just like a real masseuse would. Your buttocks, pelvis and thigh will also be gently stretched via three airbags under the seat. However, you can also massage your pelvis as two airbags hold both its sides while the massage kneads your lower back. Similarly, your calf and legs will be kneaded from the sides while the leg rest stretches your lower limbs’ muscles. So if you are in the market for a Panasonic massage chair that offers shiatsu, stretching, tapping, heat massage, deep massage, and recline features, the Panasonic EP-MA70KX is what you seek. Though this is a little pricey , it will save you thousands you would have otherwise spent on a professional masseuse. The Panasonic EP30007 Real Pro ULTRATM with Advanced Quad-Style Massage Technology Massage Chair is another great choice for you to consider. Mechanically similar to the EP30006, this model is available in a limited quantity. In addition, unlike its predecessors, it features faux wood inlay on the armrests, adding a classy look to the chair. This Panasonic massage chair offers four pre-programmed 15 minute massages: shiatsu, Swedish, deep-tissue, and arm and leg stretch massage. If you want a quicker massage, you can always choose the five minute Refresher massage program. However, you are welcome to customize your own self-program massage. According to Panasonic, you can easily come up with over 1100 massage combinations. This chair targets your arms, palms, shoulders, legs, shoulders, calf and hips through 36 airbags spread across it. You can also stretch your legs, arms and shoulders to de-stress your body. Rest assured that your body will be fully relaxed, especially as this Panasonic massage chair comes with a high-tech Auto Body Scanning system to ensure a stimulating massage. You will not even need to move a finger as the chair has a Voice Guidance System, allowing you to provide voice commands and control your massage. As you can see, the Panasonic EP30007 is a treat for those who want a completely relaxing experience. It is also a treat for your eyes since it flaunts rich black or chocolate brown upholstery, which is not only ultra-soft, but is quite durable despite requiring minimal maintenance. All of this can be yours for about $3,800. The Panasonic EP1285KL Leather “Urban” Massage Chair with Chiro Mode is the last model on this list but far from the least. Featuring high quality leather upholstery and brushed aluminum accents, this massage chair means business just from its looks alone. Its price is just as friendly at about $1,900. 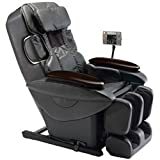 This Panasonic massage chair offers multiple massage programs and operations, including kneading, chiropractic, Swedish, Hawaiian, percussion, tapping, rolling, shiatsu, and compression. You can control these using an easy-to-use remote control and personalize your massage further. You can also alternate between two or four rollers to ensure your comfort and simulate the pressure of a palm. In addition, the 27-inch stroke guarantees full body coverage and proper back support. If you would like more than a massage through the 12 airbags spread across the chair, the EP1285KL offers to de-stress and relax your lower back, hips and thighs by stretching your legs while lowering and elevating your lower limbs at 20 degree increments. Your wrists too can benefit from Panasonic’s Float Mechanism Technology. Whichever Panasonic massage chair you choose from this list or based on your own research, rest assured that you will get the best value for your money. 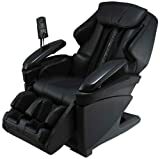 So do not hesitate and buy yourself a Panasonic chair to enjoy a full body massage whenever you want it and from the comforts of your own home. Product prices and availability are accurate as of Jul 22 11:12:00 UTC but are subject to change. Any price and availability information displayed on the merchant site at the time of purchase will apply to the purchase of this product.